"The future is completely open, and whatever we make it to be." The fact that you're struggling doesn't make you a burden. It doesn't make you unlovable or undesirable or undeserving of care. It doesn't make you too much or too sensitive or too needy. It makes you human. Everyone struggles. Everyone has a difficult time coping, and at times, we all fall apart. During these times, we aren't always easy to be around - and that's okay. No one is easy to be around one hundred percent of the time. Yes, you may sometimes be unpleasant or difficult. that make the people around you feel helpless or sad. they certainly don't discount your worth as a human being. 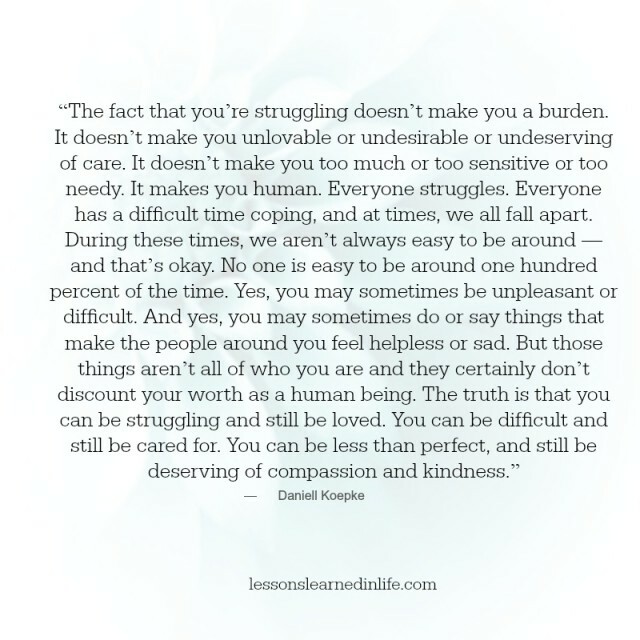 You can be difficult and still be cared for. and still be deserving of compassion and kindness.